Welcome to the PhotoJourneys Workshop’s New Website! The good news about the piles of snow is that in between shoveling (it was my fine idea that we didn’t need to buy a snow blower this year!) I’ve had time to get the PhotoJourneys Workshop’s new website up and running! With the help of the fabulous Brittany Roberts, a recent graduate of the the MassArt photo program and web designer extraordinaire, this site has become a reality. Although she is heading to Seattle for a great opportunity, she will still be helping me from the Pacific Northwest and I heartily recommend her for any web work you might have. Browse the new site and let me know what you think – I’m happy to answer questions, get feedback and talk with you about ideas for future workshops. I’m very excited about our workshops this year and have good input from past students about what they would like to see. I will be posting more information for the Portland website, but I leave in the morning for a week of sun, sand and surf in Mexico (yahoo! ), then I have a corporate shoot in Chicago in the beginning of March, but I will get the information out. If anyone is interested in a portrait/flash workshop, let me know! If we can get enough people, I’d be happy to lead one. 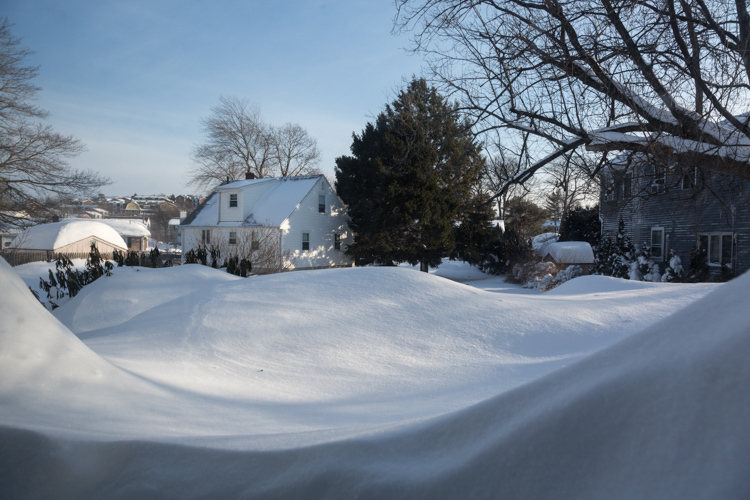 Out the back window – the snow is waist high! Here’s our white world now – I promise to post some color from Mexico!